My latest foodie experiment focused on comfort food, or at least what I think is comfort food: the meatloaf. However, if you have followed any of my past foodie experiments on this blog, you will likely have noticed that "ordinary" is far from my vocabulary when it comes to my culinary creations. 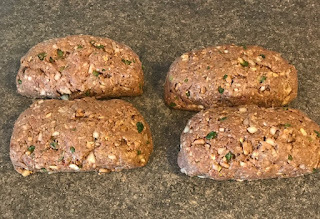 Like all good meatloaf, I started with a bunch of lean hamburger. To this I added some familiar meatloaf ingredients, and some not so familiar. Eggs, oatmeal, chopped onions, garlic powder, cayenne pepper, black pepper, a little salt, chopped mushrooms, and … chopped jalapeño peppers. Jalapeños are simply one of natures more wonderful foods. It really is a shame that they don't find their way into more foods. 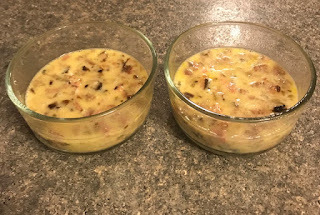 After mixing the ingredients thoroughly in a large bowl, it was set aside while I made the stuffing. 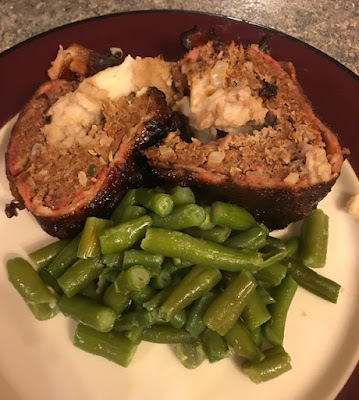 Yes, you heard that right, my meatloaf was going to be stuffed. "With what?" you ask. I'm glad you asked. I happen to make an awesome mashed potatoes, and since we're talking comfort food, and since my comfort food includes mashed potatoes, it only seemed logical to combine the two. My mashed potatoes start with washed red potatoes, cut, but not peeled. I prefer the skins on, as that's where much of the nutrients lie. Once boiled, they are mashed with butter, milk and … a tub of Philadelphia jalapeño cream cheese. Is your mouth watering yet? Now it's time to begin the finicky process of building the masterpiece. 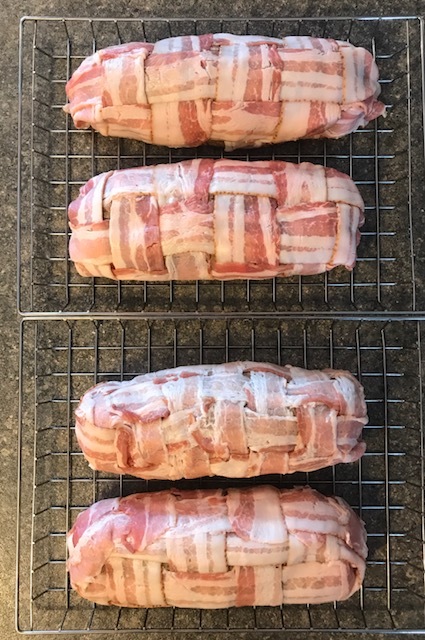 My meat mixture was rolled out using a rolling pin. 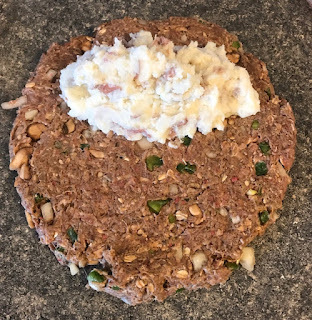 Mashed potatoes were added to one half, and then the other half of the meat was gently rolled over the potatoes and the edges crimped. If I would have stopped here, the foodie experiment would already have been a success. But, like I often desire to do when cooking, I needed to go the extra mile. How about some bacon? Bacon; the other perfect food! Oh yeah! 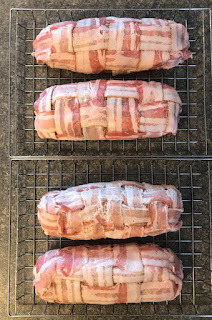 I created four bacon weaves on a sheet of wax paper, one for each meatloaf. 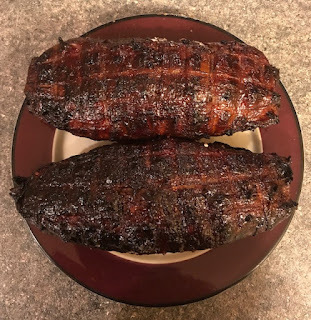 The stuffed meatloaf was then laid into one end of the bacon weave, and gently rolled in the bacon weave, tucking the end pieces of bacon into the roll, and thus making a perfect bacon-wrapped meatloaf. Finally it was time to cook the masterpieces. But here too, an oven was just too ordinary for my purposes. I decided to put them into the old Bradley Smoker and cook them over apple wood. Is your mouth watering yet? A temperature probe was inserted into the meat and it was left alone for several hours. 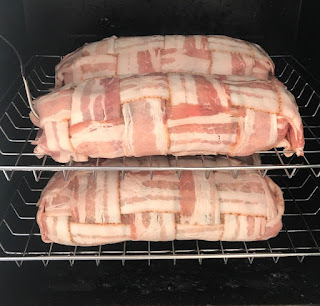 Had I not been trying to do this in the midst of a southern Alberta snow storm, it likely would have cooked a little quicker. But being a true Canadian, a little winter doesn't scare me away from outdoor cooking. 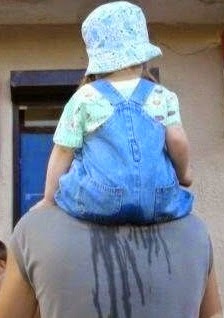 "Patience is a virtue," someone once said. Our patience once again paid off with an amazing dinner. A lot or work? Yes, but for me being a foodie is much more an enjoyable hobby than a chore. 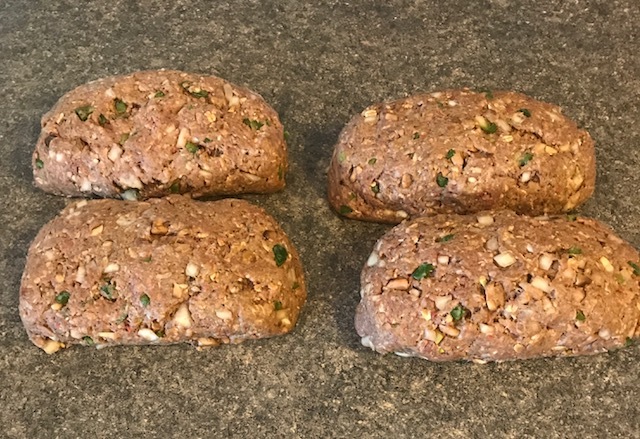 Look at those beautiful meatloafs . As an aside, when I showed this picture to a friend recently, he thought it looked like one of the "Teenage Mutant Ninga Turtles." LOL. I guess it does. After making a few freezer packs there was still a few left overs the next morning. Hmm. Suddenly another foodie idea came to mind for breakfast. Baked eggs and smoked jalapeño meatloaf? Why not? One never knows unless they try. Four eggs were whisked and poured into two small glass oven-safe dishes that had been pre-sprayed with cooking spray. 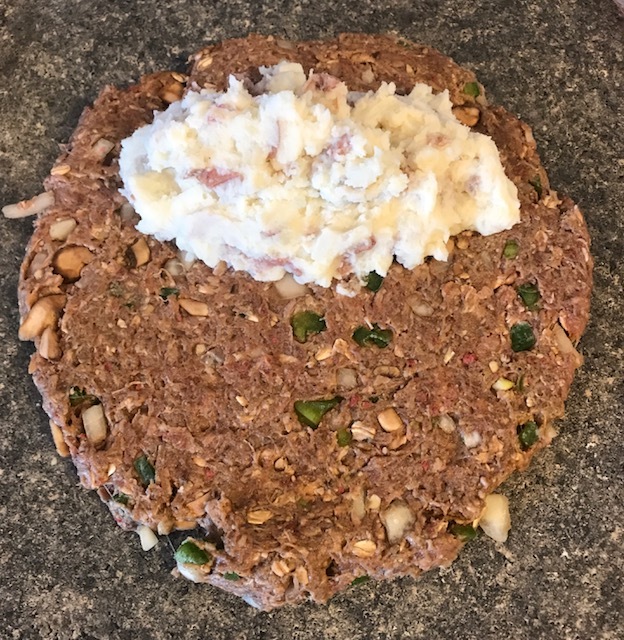 The left over meatloaf, including its potato stuffing and bacon wrap, was finely chopped and dunked and fully submersed into the eggs. 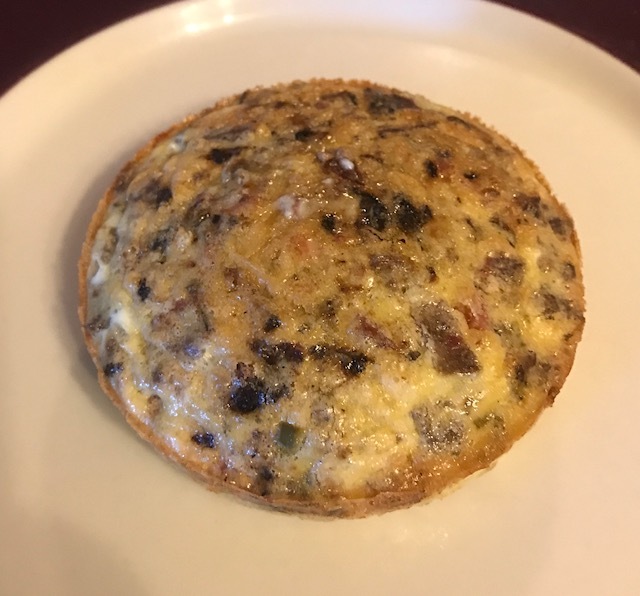 This concoction was baked in a 300-degree oven until the eggs were fully cooked. Ah, breakfast will never be the same; nor will dinner the night before. Onion Rings: Breakfast's Other Perfect Food? A Stool for Better Stools?